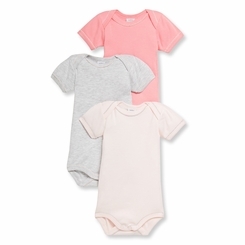 These baby girl's cotton bodysuits, sold in sets of 3, have short sleeves and an envelope neck for easily dressing baby. Note the tone-on-tone snaps at the crotch and the fancy picot finish. We love the coordinated colors in this set of must-have baby bodysuits, alternating between lively and soft.